Iowa state regulations mandate that each licensed pharmacy maintain an updated and comprehensive reference of Iowa pharmacy laws and regulations as part of its reference library (657-6.3(155A)). The Iowa Pharmacy Law and Information Manual is a comprehensive manual that includes Iowa Code, Board of Pharmacy rules, Controlled Substance laws, as well as Medicaid and other Healthcare Provider rules. 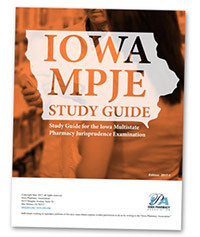 Digital Study Guide for the Iowa MPJE. MEMBERS: Login to see your discounted price!